For people in Central North, Midlands and parts of Upper Derwent Valley, South East, North East, East Coast, North West Coast and Central Plateau Forecast Districts. Issued at 2:08 am Saturday, 6 April 2019. Severe thunderstorms are likely to produce damaging winds and heavy rainfall that may lead to flash flooding in the warning area over the next several hours. Locations which may be affected include Launceston, New Norfolk, Bothwell, Hobart, Geeveston and Dover. Severe thunderstorms are no longer occurring in the Western district and the warning for this district is CANCELLED. 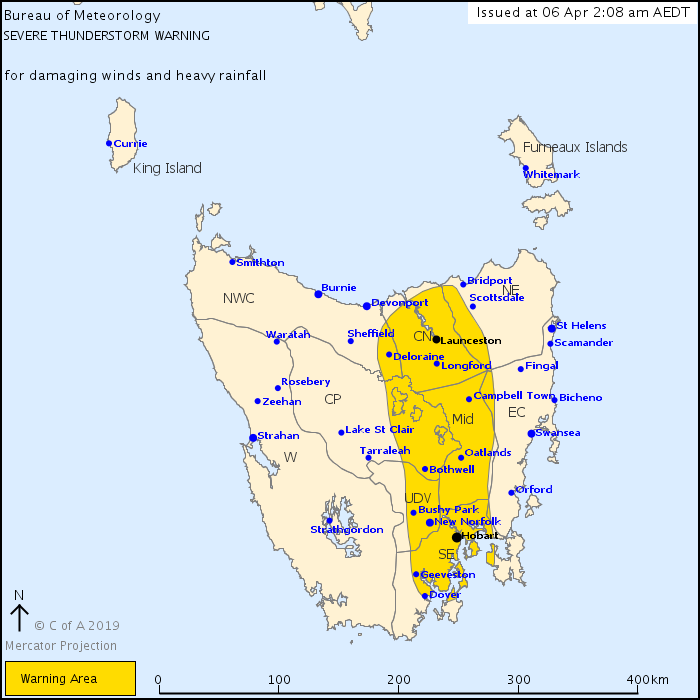 A line of thunderstorms that moved over the west coast has produced wind gusts of 94 km/h at Strahan at 12:20am.